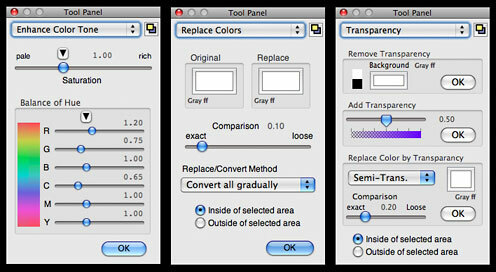 For the past seven years or so, the image editing tool I use most - a lot more than Photoshop Elements or Pixelmator - is the very professionally turned out freeware ToyViewer, which I find slicker than any other software I know of for simple image resizing and format conversion. ToyViewer also has some handy image correction filters. This month, ToyViewer's developer, Mr. Takeshi Ogihara, released Version 5.0 of the application, upgrading it to support Mac OS X 10.6 "Snow Leopard", and also releasing separate version 5.0 builds for OS X 10.4 "Tiger" and OS X 10.5 "Leopard". This is ToyViewer's most substantial upgrade in several years, with the already very attractive user interface facelifted for a fresh look, some new features, and expanded preferences. It's always a bit disconcerting when a software tool one depends on receives a major overhaul - sort of like someone coming into your home while your out and rearranged the furniture. That analogy is probably a bit exaggerated with this upgrade, at least in terms of appearance, since everything is still where one expects to find it, but in terms of functionality with OS X 10.5, which I'm still using, there are some problematical issues. The most serious of these for me is the way ToyViewer 5 handles PICT images imported through the Clipboard - one of the most frequent modes I use with ToyViewer. OS X 10.5 screen shots are copied as PICT images, and it's also the default screen shot format for Color It! 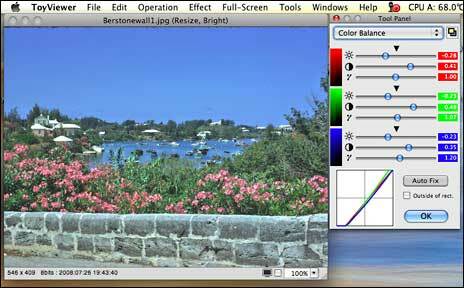 4.5, another venerable image editing application I still use a lot. The long and short of it is that at least in its Leopard iteration (and probably the Tiger as well), ToyViewer no longer renders Clipboard PICT images usably, with the result both grossly enlarged and its aspect ratio distorted. This is serious enough that it will probably be necessary for me to downgrade to ToyViewer 4.92, at least until I upgrade my operating system to Snow Leopard. In the meantime, I'm using OS X Preview as a "PICT buffer" of sorts to convert screen shots copied directly to the Clipboard (Command-Shift-Option-3 or -4) and Clipboard cuts from Color It! to ToyViewer-friendly formats. In the release notes posted on his website, Ogihara warns that in ToyViewer 5.0 for Mac OS X 10.4 or 10.5, "some functions won't work as expected," attributing the reason to limitations in the WebKit API, so current Tiger and Leopard users should check the list of caveats he has posted before deciding whether to install this version update or stick with ToyViewer 4.92. Images with CMYK color space can be dealt with easily. TIFF Stacks, that is, TIFF image files with multi-frame, can be displayed. Moreover, ToyViewer can show animation of TIFF and GIF files with multi-frame. Displayed images can be easily enlarged/shrunk by new mouse operation. As before, ToyViewer can read and display image files in a wide range of file formats including: tiff, jpg, pdf, png, gif, bmp, pict, JPEG2000(jp2, jpc, j2k), and eps. ToyViewer also deals with svg, jbig(bie), pcx, pcd, pnm (ppm, pbm, pgm), xbm, mag, SUN Rasterfile and others. For example, if you have Adobe Photoshop, ToyViewer can display psd image files. You can set ToyViewer to display any image format if there is a filter program to ppm format. Displayed images can be saved as follows: tiff, pdf, gif, bmp, png, jpg, JPEG2000 (jp2, jpc, j2k), jbig (bie), pnm, or xbm. Vector images such as PDF can be converted into bitmap images such as jpg or tiff. Color profiles embedded in image files can be replaced. Exif and GPS information are also displayed. You can save image files with/without Exif and GPS information. Moreover, you can add comments to images (depending on file format). ToyViewer can display each image file in a folder one by one in full-screen mode. You can also mark images to move - or to delete. With this feature, ToyViewer can be used as a no-hassle slideshow or comic viewer. ToyViewer can display images in full-screen and in front of all other windows. If you like a displayed image, you can make it the Desktop picture (wallpaper) of your Mac. ToyViewer provides simple animation player for animated GIFs and TIFF Stacks. Additionally, each frame of and each page of a PDF can be viewed as a single image. As always with ToyViewer, you can rotate, flip, clip, enlarge, or shrink images. 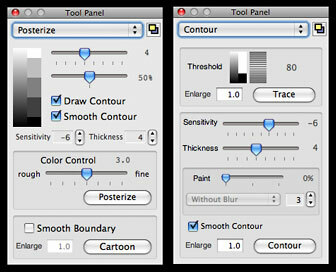 While it's complimentary to, rather than a replacement for, a full-featured image editor like PSE or Pixelmator or Acorn, given it's lightweight and nimble speediness, ToyViewer has surprisingly powerful ability to adjust brightness, contrast, and color tone of images if you need some quick and convenient image manipulation. You can replace a specified color with another color or transparent color and also make images with palettes or convert them to monochrome images. ToyViewer has some typical operations to images, such as enhancement, blur, mosaic, and so on. You can also make Aqua-button-like images, poster-like images, and more. Images can be printed. An image is automatically shrunk to be printed on a sheet or divided into multi pages. ToyViewer 5.00 is not available for Mac OS X 10.3 (Panther) and earlier versions. You can use ToyViewer 4.92 or earlier ones with these versions. Version 4.92 - (at least for Tiger and Leopard users) 4 out of 4. Version 5.0 - (for Snow Leopard) not rated until I get to try it. If the Clipboard glitch is not present, I provisionally anticipate 4 out of 4.